Our Projects | Wells For The World Inc.
Our May 2015 trip to Kenya was a success. 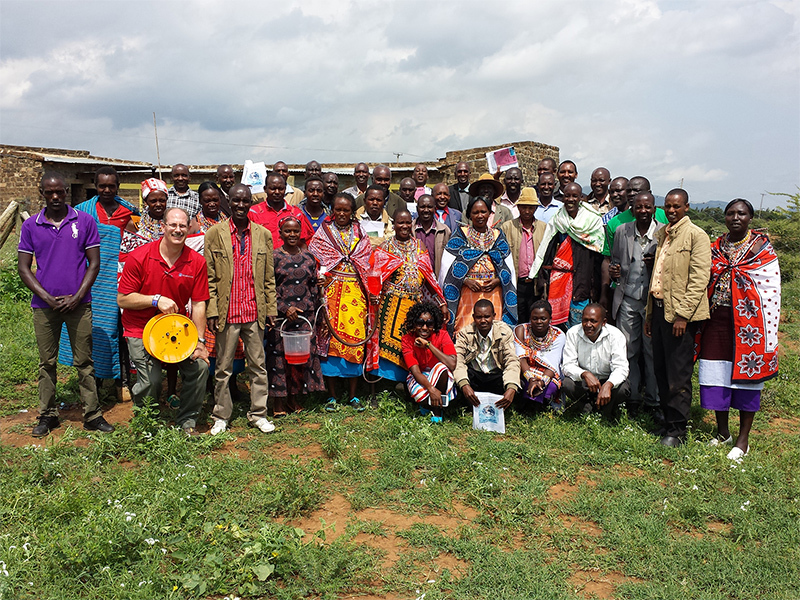 We provided the Kitilikini Namuncha Ewuaso Kedong Water Resources Users Association (KINEK WRUA), who we met during our 2014 trip to Kenya and Tanzania, with three days of training we are calling "Hydrogeology for the Maasai" (in particular, the water cycle, Darcy's Law, well installation, testing and maintenance techniques), which included a review of the Kenyan Water Act (Act No. 8 of 2002) and the associated Water Resources Management Rules as administered by the Water Resource Management Authority (WRMA), which is incorporated under the Ministry of Water and Irrigation, a division of the Kenyan federal government. 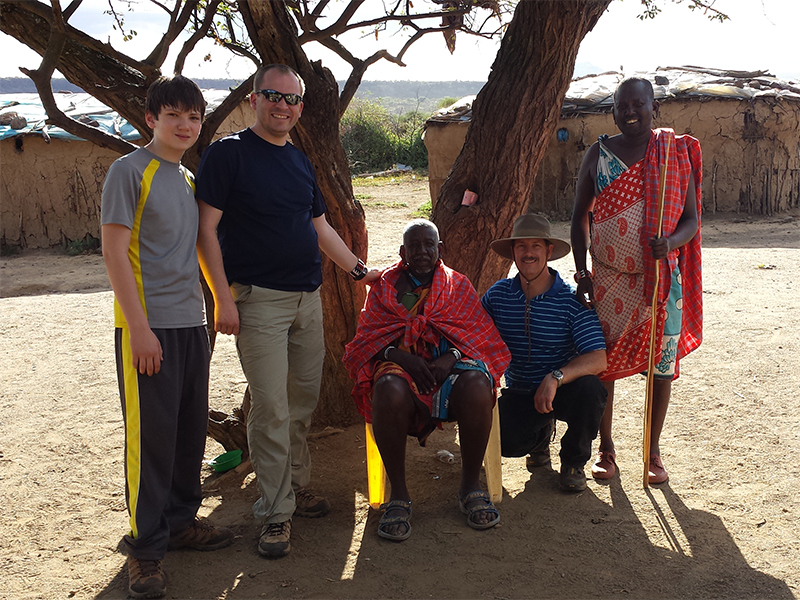 We are so glad to have had the opportunity to spend the time in Maasailand with so many wonderful Maasai and other people and made numerous new friends. Our training was attended by at least 41 WRUA members each day, and on the first day we had 58 people in attendance at one point during the day. Wells for the World is working closely with leadership team of the ﻿KINEK WRUA﻿, who received their certificate of registration on March 20, 2014 and are able to undertake water projects with their certification. 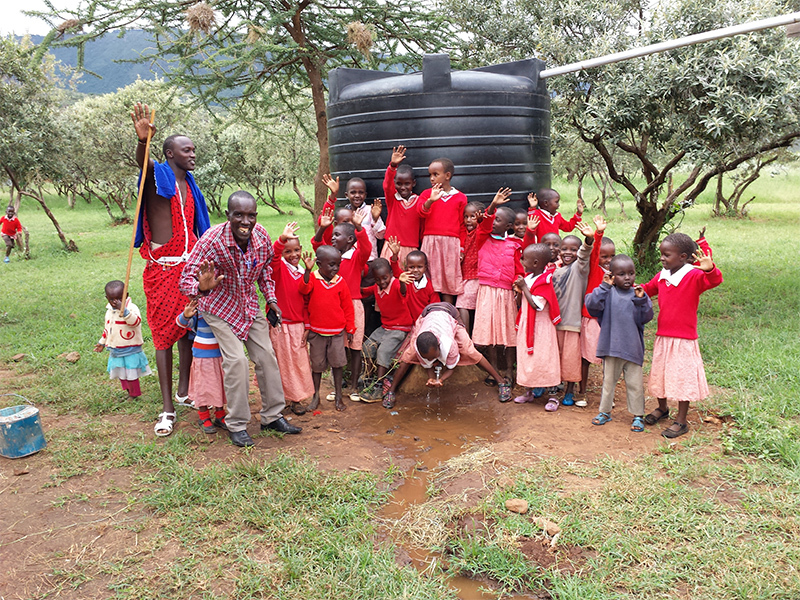 ﻿﻿Wells for the World provide the AIC Namuncha (Kenya) Child Development Center (CDC) of which Solomon is the director (a charitable endeavor that provides education, meals and other necessities to 100 children in Namuncha), with two 2,000 gallon water holding tanks, which were installed on April 14, 2015, because even though they have a connection to the same water source as Ewuaso (see below) with the severe drought in the area a few days a week there is no water available (due to over withdrawal and the water pressure in the pipeline). The CDC wants to fill and store water when the water is flowing and use the stored water when water is not available from their usual water source. The total cost of this project was $1,950. The CDC will also provide access to their excess water to the Namuncha community potentially helping hundreds of additional people! During our meetings over a two day period with the KINEK WRUA, we were able to visit several water related features in the area, several of which the KINEK WRUA would like to explore as possible water projects. 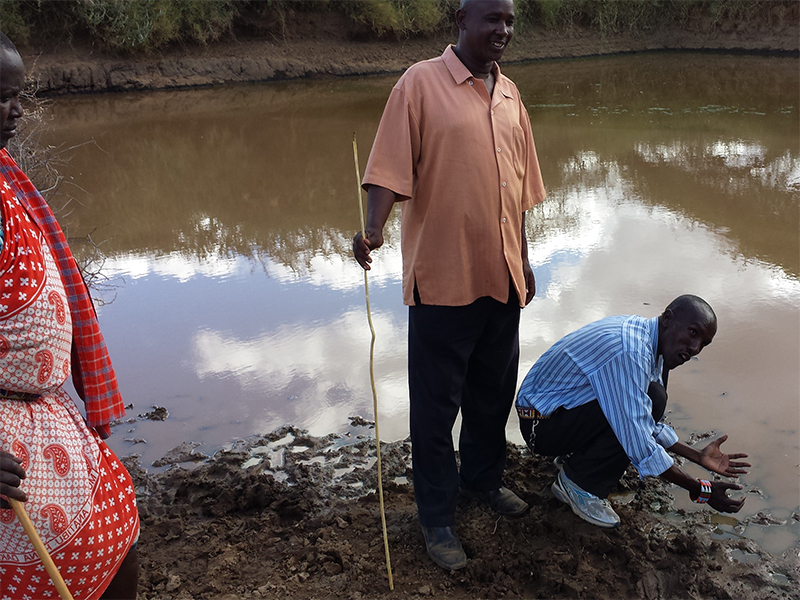 The first was a typical catchment (click for photos) or retention basin, which collects rain water, and like most catchments in Maasailand the runoff comes from pastureland, which can pickup contaminants from the animals. We are working to obtain more information about other wells throughout Maasailand that may need to be repaired and maintained. By using our connections through Justus and the KINEK WRUA to get the word out to other WRUAs that we would be interested in knowing about other wells and requisite area needs. Our goal is to start with these existing wells because hopefully we can restore their usefulness for a reasonable cost; thereby, providing the most sustainable clean water for the lowest cost. See our idea about raising funds to outfit a pump hoist vehicle under our Vision for the Future below. Where wells can be installed and sustainable water is available, wells offer one of the best opportunities to help the most people. This goes for Maasailand and Africa, but also many other world areas where sustainable sources of groundwater are available. Therefore, one desire we have is to raise enough funds to secure (whether through purchase or donation, or a combination of both) drilling rigs either in Africa or elsewhere and have them transported to Maasailand and then train locals to operate the drilling rigs and install wells and perpetuate the installation and maintenance of wells by providing each drilling rig with the fuel and drilling supplies necessary to perpetuate the installation and maintenance of additional wells.Once we have established a process in Kenya and Tanzania, Wells for the World would like to duplicate those efforts in other areas that desperately need sustainable sources of clean drinking water - through wells, rain collection/catchment systems, surface water and filtration/treatment and by providing better sanitation as well.